It seems that Accu-Cast Incorporated appeared sometime around the 1960s*. The company was based in Amherst, New Hampshire and produced a series of diecast reproductions called "Replicars". * April 2015 I have been contacted by Edward John Hamer who advises "I used to be the mold maker for Accu Cast including the Toys of the 20's series. Accu Cast was incorporated in 1976 and went out of business in about 1980. The three partners are long gone now. They were Edward George Hamer (my Father), Jerome Goldhammer, and Robert Vale." This series of reproductions was recreated from examples of toys produced in the 1920s using centrifugal casting techniques of the 1960s 1970s. 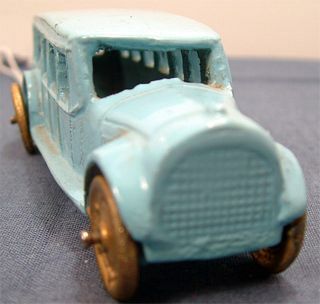 These original 1920s toys were pretty realistic in terms of their shape when compared to the real vehicles of the time. "Toys of the Twenties" appears to be a series of reproductions based on toys contained in a private collection. It is possible these original toys were used to make casts from which the centrifugal dies were cast, as some I have seen (including my own White Intercity Bus) have all the faults of the original toy (in my case a bent and warped roof and window pillar). Each item in the "Toys of the Twenties" series is accompanied by data on the original full size vehicle.